In the past 20 years the Operations Management and Information Systems (OM/IS) fields have widely applied game theory these fields had previously been more focused on analyzing and improving the performance of a physical system (e.g., queueing or inventory systems) from the decision theoretic perspective. 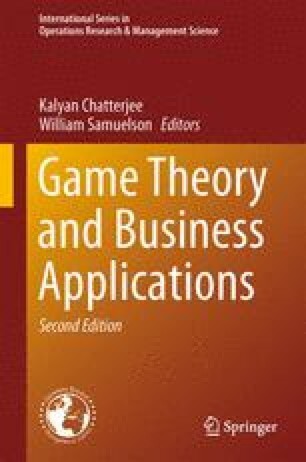 This chapter gives an overview of the existing OM/IS literature applying game theory. We focus on five topics: (i) time-based competition, (ii) priority pricing for a queueing system, (iii)manufacturing/marketing incentives, (iv) incentives for information sharing in a supply chain, and (v) distortion and alignment in a horizontal supply chain. On each topic, we review one or two works at some length and list other related works as references. The authors would like to thank anonymous referees and the editor for many valuable comments and suggestions.